Robert Downey, Jr., shines anew as the man of metal in Iron Man 2. But, it is his dual identity as Tony Stark that breathes imagination into a comic book character whose publishing premiere began in 1963. Iron Man is a modern hero at the dawn of a hectic millennium. Director Jon Favreau is back at the helm to weave parallel storylines into a dizzying masterstroke of digitized entertainment that captivates audiences of all ages. Rapid repartee, awesome action and vivid visual graphics keep this movie moving at an accelerated pace. Through the use of his ironclad contraption, Stark has wielded an uneasy world peace. Nonetheless, Stark was subpoenaed to testify before a Senate hearing and stated that the technology to build a competing animated suit of armor was a comforting decade away. Abruptly before a satellite broadcast, an ominous villain, Ivan Vanko in the malevolent form of Whiplash, crashes the Circuit de Monaco underway to dispel this assertion. Potts and Hogan risk their own lives in order to deliver the iron football to their vulnerable employer. Stark's exaggerated fears over concern for his health results in turning to the bottle to drown out his despair which unleashes internal demons that manifest themselves in irresponsible behavior. Stark becomes wasted and unruly at his own birthday party requiring Rhodey to suit up in a War Machine to contain the intoxicated celebrant. In an unprecedented move to put distance between himself and the demands of daily pressures, Stark appoints Potts as the new CEO of Stark Industries. To further complicate interpersonal matters between them, Natalie Rushman (an undercover Russian spy from S.H.I.E.L.D.) assumes an assistant position to keep a close eye on Stark. The series of subplots erupt as an unknown figure from the past resurfaces to challenge the Stark family legacy and Tony Stark directly which spawns a spectacular showdown between Whiplash who is opposed by Iron Man with the aide of War Machine. These titanium titans tussle for dominance. Mickey Rourke turns in a gritty performance as a vengeful outlaw hell-bent on punishing Stark for the sins of his deceased father. Sam Rockwell embodies avarice personified as Justin Hammer, a rival military weapons contractor out to out bid and bid his competitor farewell. Comedian Gary Shandling delightfully debuts as U.S. Senator Stern and trades charged barbs that interject humor and wit at the speed of sound. Don Cheadle takes over the role of Lt. Col. Rhodey Rhodes in this second feature film. Scarlett Johansson is the stunning Natasha Romanoff who moonlights as a lethal secret agent. 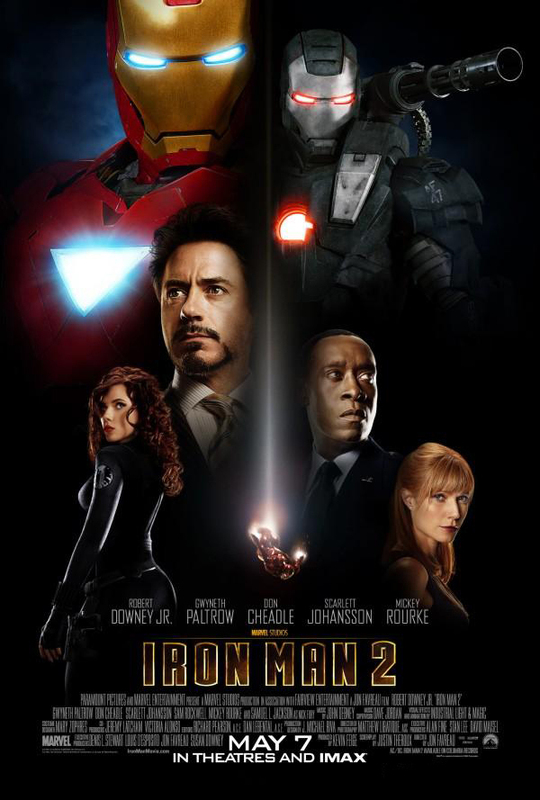 A host of character roles from Iron Man are reprised: Gwyneth Paltrow as the alluring Pepper Potts, Leslie Bibb is the trampy reporter Christine Everhart eager to land a newsworthy spread, Jon Favreau as trustworthy manservant Happy Hogan, and Samuel L. Jackson returns as S.H.I.E.L.D. Director Nick Fury who engages Stark to realize his personal potential. Marvel has more Super Hero cinematic vehicles up its sleeve to unveil. The Iron Man 2 after-credits cliff hanger foreshadowed a new super hero on deck, Thor. Iron Man 3 is projected to arrive in time for the 50th anniversary of the impregnable knight in gold & scarlet armor. Super Heroes mean super business. The Marvel franchise sequel has earned a go-ahead for its third installment to recapture fans of the mechanized crime fighter. Although outside the Marvel universe, a crime fighter who once buzzed about American radio receivers during the Depression era will experience a revival next January, The Green Hornet.